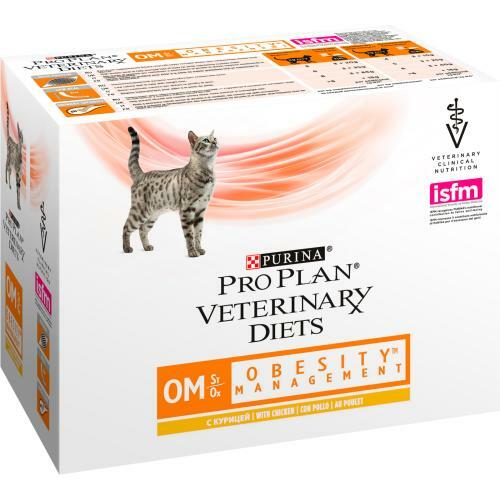 PURINA VETERINARY DIETS OM is a delicious & nutritionally complete diet, clinically proven to support effectual weight loss in cats. A low fat, low calorie diet, Feline OM is rich in protein, helping to promote lean muscle whilst encouraging steady, continued weight loss. The dry formula has the added benefit of combating bladder stones, a frequent problem in cats struggling with their weight. It’s never too late to start trying to lose weight, and Feline OM is formulated with high levels of dietary fibre to help your cat to feel full & satisified at meal times, and is suitable for maintaining your pet’s weight, once it reaches a healthy level. Most importantly, Feline OM is mouth wateringly delicious to make sure the weight your furry friend loses stays gone! Please note, PURINA VETERINARY DIETS OM is not recommended for pregnant queens or growing kittens. Ingredients: Meat and Animal Derivatives (of which Chicken 4%), Fish and Fish Derivatives, Derivatives of Vegetable Origin, Cereals, Minerals..
Analytical Constituents: Moisture: 80.0% , Protein: 10.6% , Fat content: 2.5% , Crude ash: 2.7% , Crude fibres: 1.6% , Taurine: 1400mg/kg , ME: 0.67kcal/g. Nutritional Additives (IU/kg): Vit. A: 1 100 , Vit. D3: 160 , mg/kg: , E1 33 , 3b202: 0.65 , E4: 4.1 , E5: 5.9 , E6: 82 , E8: 0.054.